Insert Remove a Prosthetic Eye | Ocular Prosthetics, Inc.
Inserting and removing a prosthetic eye might seem like a challenge at first, but with a few guidelines and routine practice it will become second nature. It is important to become comfortable with these procedures soon after receiving your prosthesis. This is especially true for children, as they will need their ocular prosthesis cleaned at home more frequently. Before handling your prosthetic eye make sure your hands are clean and free of any debris. Make sure your surroundings are forgiving to the fact that you may accidently drop your prosthesis. This may include putting a towel over the bathroom sink to prevent the prosthetic eye from becoming damaged or lost. Damage to the prosthetic eye can severely limit the comfort, wearability, and cosmesis of the prosthesis. So be especially careful during handling. Depending on your individual preference, using a suction rod or your fingers, these procedures will vary accordingly. If you would like a suction rod to aid in the insertion and removal of your prosthesis please ask your ocularist at your next appointment. The procedures for each method are listed below. To insert the prosthesis with your fingers – lift the upper lid with your index finger to create an opening and slide the top edge of the prosthesis under the upper lid. While holding the artificial eye in place, release the upper lid and pull down the lower lid to insert the prosthesis into position. 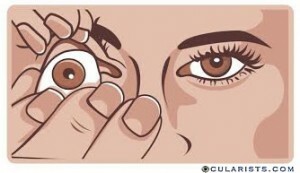 To insert the prosthesis with a suction rod – attach the suction rod to the artificial eye by squeezing and releasing the handle. Lift the upper lid with your index finger to create an opening and slide the top edge of the prosthesis under the upper lid. While holding the artificial eye in place, release the upper lid and pull down the lower lid to insert the prosthesis into position. Squeeze the suction rod handle to release. To remove the prosthesis with your fingers – pull down the lower eyelid with your index finger and allow the prosthesis to slide out, over the lower lid. Then gently remove the prosthesis with your free hand. To remove the prosthesis with a suction rod – attach the suction rod to the artificial eye by squeezing and releasing the handle. 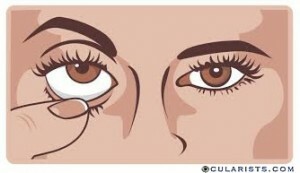 While holding the suction rod, pull down the lower eyelid with your other index finger and gently remove the prosthesis. Upon receiving your custom made prosthetic eye, your ocularist will practice these insertion and removal procedures with you. Additional reference material will also be provided upon request. If you are having trouble inserting or removing your prosthetic eye, do not hesitate to contact us. Our team of board certified ocularists will be happy to answer any questions you may have.